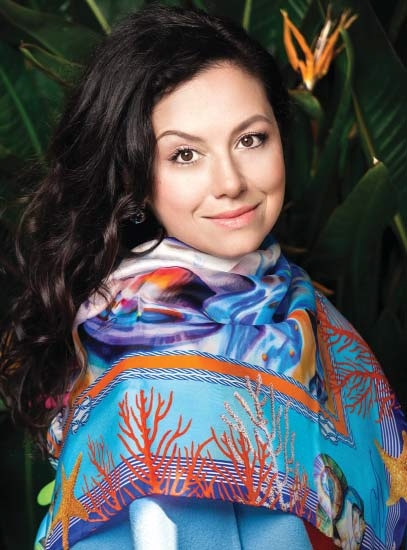 Alexandra Otieva belongs to the certain type of artists who are not tired of experiments, of opening up new facets of her creative self, whether it's watercolour, print on china or author’s scarves. Her style of life can be defined today by the term "self-made" – a philosophy according to which a person creates himself only. Being a sensitive creative personality and a manager at the same time, Alexandra got used to rely only on herself. 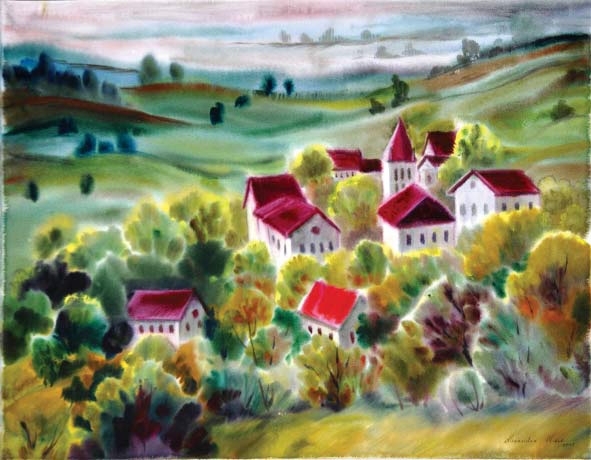 Today she is a popular artist whose works are highly appreciated by audience and collectors. Alexandra, how it happened so that Côte d'Azur became the place for life and creative work? To begin with, I was born in Saratov – a city on the bank of the Volga River. And for reasons unknown to anyone, I knew that I would live by the sea since I was about 14 years old, but yet did not know where exactly. I have been painting since childhood. My first teacher of drawing was my father who made a business of minting. 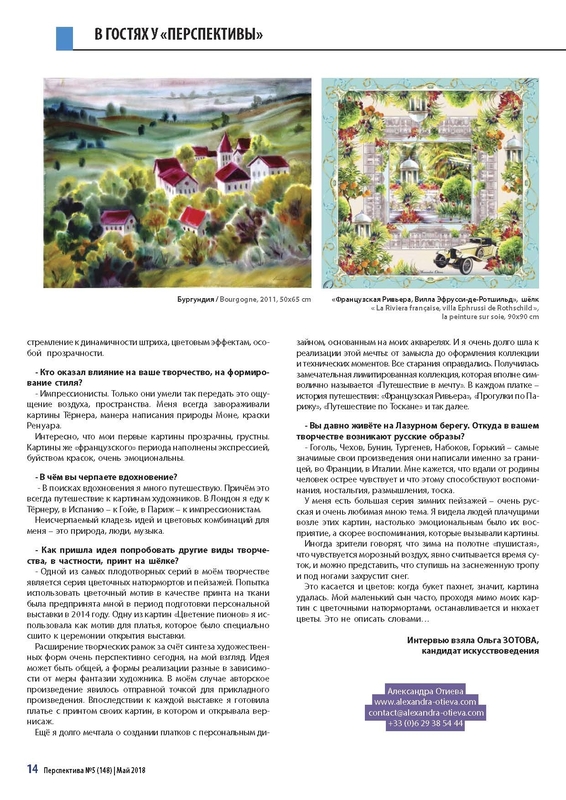 I got art education in the creative workshops of the Union of Russian Artists. And my first foreign exhibition was held in France in 2001. I was the youngest participant there. Some of my works were sold before the official opening of the exhibition. Then there were the Great Britain, Paris, soul searching. I came to Nice for vacation, without any thought of linking my life with France. I was interested why the French Riviera attracted so many artists and writers, the royal family, the English aristocracy. On the fifth day of my stay, there happened something that changed my life forever: I fell in love with the turquoise colour of the sea and realized that it was here – the place where I wanted to live and create works of art. Once, many years later, my mother came to visit me. Looking out of the window early in the morning, she told me: "Look, this is exactly the landscape that you painted when you were 15." It seems to me that there are optimal conditions for creativity here: the abundance of sunlight, amazing colours. It is no accident that many famous artists came here to create their masterpieces. You have been working with watercolour on a wet paper for more than 17 years already. Why did you choose such a complex technique? Indeed, this is one of the most complex techniques. Paints are applied to a sheet of paper densely wet with water in one go. I, for example, always work while standing up, continuously, 5-7 hours in a row. You cannot make a mistake, because the paint is immediately absorbed into the paper. Intuition, a certain foresight is important, because it is not always possible to predict the final result. Watercolour is a very capricious thing! It reflects my desire for dynamic strokes, colour effects, special transparency. Who left a personal stamp on your creativity, style formation? Impressionists. Only they knew how to convey this feeling of air and space. 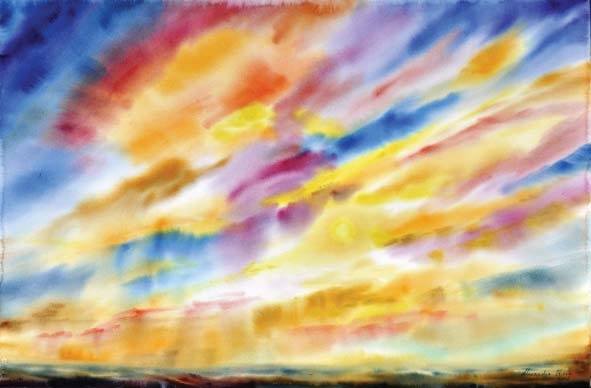 I was always fascinated by Turner's paintings, Monet’s manner of depicting nature, the colours by Renoir. It is an interesting fact that my first pictures are transparent and sad. But the pictures of the "French" period are filled with expression, riot of colours, are very emotional. In search of inspiration, I travel a lot. And this is always a journey to see the paintings of different artists. In London I'm visiting Turner, in Spain – Goya, in Paris – the Impressionists. An inexhaustible storehouse of ideas and colour combinations for me is nature, people, music. How did the idea to try other forms of creativity, in particular, print on silk, come to you? One of the most fruitful series in my work is a series of flower still lifes and landscapes. An attempt to use a floral pattern on fabric as a print was undertaken by me during the preparation of my solo exhibition in 2014. One of the paintings "Peonies in bloom" I used as a pattern for the dress, which was made especially for the exhibition opening ceremony. In my opinion, expansion of the creative framework by means of the synthesis of artistic forms is very promising today. The idea can be general, but the forms of implementation are different depending on the imagination of the artist. In my case, the author's work was the starting point for an applied work. Subsequently, for each exhibition I prepared a dress with a print made of my paintings, which I was wearing during the opening day. I was also dreaming a lot of creating handkerchiefs with a personal design based on my watercolours. And the way towards the implementation of this dream was very long: from a simple thought to the design of the collection and technical details. All the efforts were justified. A wonderful limited collection was created, which is quite symbolically called "Journey to a dream." 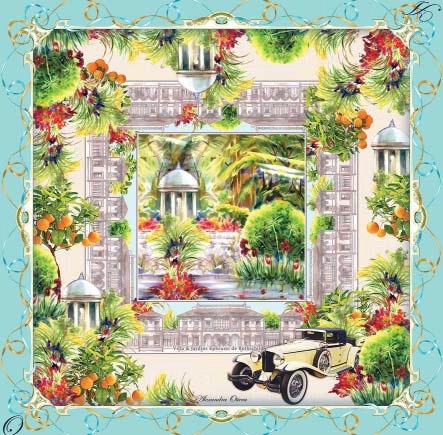 In every scarf, there is the history of a journey: "French Riviera", "Walks in Paris", "Travelling in Tuscany" and so on. You have been living on the Côte d'Azur for a long time. Where do your Russian imageries come from? Gogol, Chekhov, Bunin, Turgenev, Nabokov, Gorky – they wrote their most significant works abroad, in France, in Italy. It seems to me that far from the homeland the feelings of a person are sharper, and that memories, nostalgia, reflections, melancholy contribute to it. I have a large series of winter landscapes – a very Russian and very favourite topic for me. I saw people crying in front of these paintings – so emotional their perception was, but rather the memories that were caused by the paintings. Sometimes spectators say that the winter on the canvas is "fluffy", that the frosty air is felt, the time of the day is quite clear, and you can imagine that you step onto the snowy path and hear the crunch the snow under your feet.